of a reticular, spongy, or lattice-like structure; said mainly of bone tissue. (kan'sĕ-lŭs), Do not confuse this word with the noun cancellus. Denoting bone that has a latticelike or spongy structure. /can·cel·lous/ (kan-sel´us) of a reticular, spongy, or lattice-like structure. Having an open, latticed, or porous structure. Used especially of bone. (of tissue) latticelike, porous, spongy. Cancellous tissue is normally present in the interior of many bones, where the spaces are usually filled with marrow. Of a spongy, porous, lattice-like structure. A term applied to the inner parts of bone. bone to refer to the spongy, typically artery- and vein-rich section at the ends of long bones. 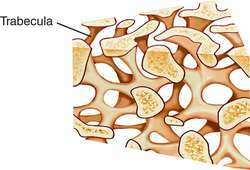 of a reticular, spongy or lattice-like structure; said mainly of bone tissue.